The most famous group coming out of Greek mythology are the gods of Olympus, but they were not the first deities of the Greeks. According to myth and legend, before the Twelve Olympians there were the Titans. They were born from the primordial gods, those that represented forces of nature such as Gaia, or the earth itself. While the Olympians were very mortal in their appearance and appetites, the Titans were something else. Gaia was the mother of the Titans, and she was impregnated by Uranus, who used his power to keep their children imprisoned in Gaia's womb. According to legend the youngest of their children, Kronos, lost no love for his father, and set to free his siblings (and presumably himself.) In order to do so he castrated his father, and this (in one fashion or another) broke the power over Gaia that kept her in a state of perpetual childbirth. Kronos, the youngest, was now the hero of the day. His bothers and sisters were Oceanus, Coeus, Crius, Hyperion, Iapetus, Thei, Rhea, Themis, Mnemosyne, Phoebe and Tethys, and now they served him. Kronos, alson known by such adjectives as "wily" and "terrible", took his sister Rhea as a wife and began to emulate his hated father, after a fashion. There are a lot of repeating themes in mythology in generally, and Greek mythology is no exception. There were Twelve Titans, and there followed Twelve Olympians. Kronos's father kept his children from being a threat by keeping them in Gaia's womb; Kronos took a different track to the same destination. When Rhea gave birth to the first of their children, Kronos took it upon himself to imprison them by swallowing the little godling. Kronos, often spelled Cronos, continued his habit of ingesting his children until Rhea had just about enough of it. When Zeus was born Rhea wrapped a stone in swaddling cloths and gave it to Kronos, who - apparently not possessed of a very sophisticated palate - swallowed it and believed it to be his son. With the help of Gaia, Zeus laid a trap for Kronos after he had grown. A feast was laid out and Kronos was fed food and drink till he was drunk; Zeus then gave him a potion to cause him to vomit up his children, and the Twelve Olympians were on the scene. Naturally there was soon to be a war with the Titans. Zeus had taken control. After a while, according to one legend, Zeus was going to give up his throne for the infant Dionysus. The Titans wanted the throne for themselves, so they killed Dionysus and ate him. 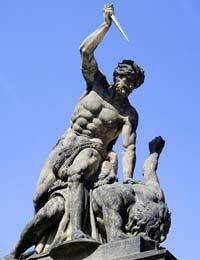 Zeus destroyed them all with his thunderbolt after he found out. According to Greek Myth, humanity sprung up from either the blood shed in a war with the Titans, or from the fat from their burning corpses. While fantastic, there is a possible connection with the legendary Titans and actual men from Geek history. The word Titan comes form a Greek word that means white earth, or clay; it is possible the word came from men who would paint themselves with gypsum, white clay, while performing rituals.